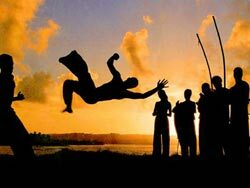 Capoeira is a Brazilian fight-dance, game, and martial art created by enslaved Brazilians during the 17th Century. The objective is to promote health, fraternity, cultural awareness, and non-violent self-defense through the Capoeira. The game is marked by fluid acrobatic play, feints, subterfuge, and extensive use of groundwork, as well as sweeps, kicks, and headbutts. Less frequently, elbow-strikes, slaps, punches, and body-throws are used. Technique and strategy are the key elements to playing a good game. Capoeira does not focus on injuring the opponent. Rather, it emphasizes skill. Capoeiristas often prefer to show the movement without completing it, enforcing their superiority in the roda. If an opponent cannot dodge a slow attack, there is no reason to use a faster one. Each attack that comes in gives players a chance to practice an evasive technique.